Looks really good. I like your decision to stick with old school red. 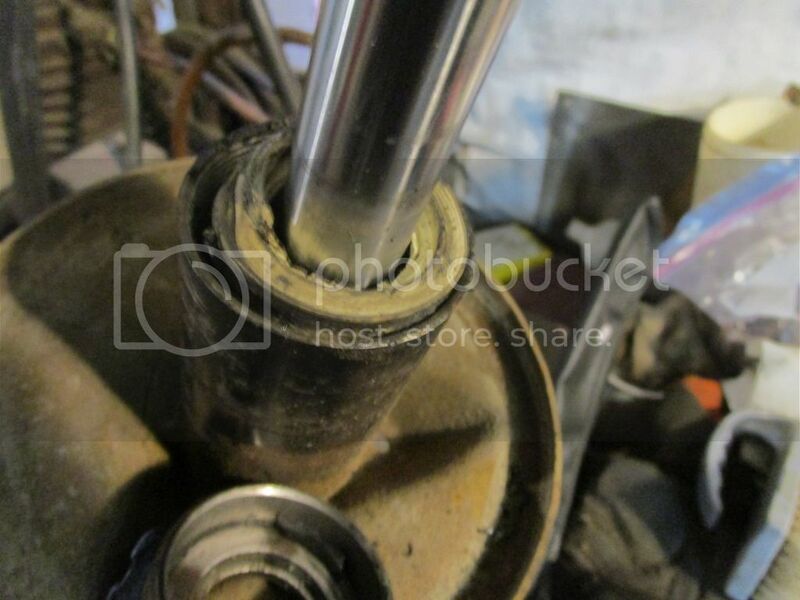 strut rod bushing kit will be in @ 11:30. know what I'll be doing tonight. it was quick but I don't commute. the time others spend sitting in traffic im in the shop turning wrenches. this is Mandy's new toy and our DD wile 6inches gets new rubber, paint and a rebuild on the z24. winter has not been kind to red, passenger fender has some small bubbles poking up, rolling the fenders knocked off a bit of paint... and the windshield gasket has sprung a leak....floor pans need some help and the trunk seal is a wet blanket..
Byron how bad was your fuel consumption when you ran the yokos on old blue to Ashcroft with its 1300 ? I dropped from 32-34mpg down to about 18mpg on the L16. with the snow gone the westerns are back on. to treat Red for all I put her through I gave her a bath and installed a 68 grill . next nice day she will get a new trunk seal. Yikes! Sounds like a close one!! Glad to hear ya made it out with no extra work to do on the car ......... or you! it was not the tires it was the car trying to kill me. dissembled the front end swapped in the 68 struts with rebuilt stock inserts on 20w with some nissan sentra fastback rear springs. installed the 7/8th bar from Ron, thanks man! its like a different car. Glad you got that figured out Robyn. daily driving downs.... last sunday after weeks of sporadic coolant loss the culprit revealed its self with a hiss. I just got off the south Fraser perimeter road, stopped the car and walked around pass the front of the car when I heard a hiss and frying bacon. since I was not climbing a steep hill I knew the sound of bacon cooking was a bad omen. I popped open the hood and was met with a face full of steam. the culprit was not easy to spot... it looked like the head had separated from the block as there was a stream of coolant and oil running down the full length of the block... but no it was the small 40+ year old thermostat by pass hose spraying a jet of coolant on to no2 exhaust, right at the flange. the steam loosened the oil giving the appearance of catastrophic head gasket failure. some tie wire and a few turns of the vicegrips and all was good for the return trip home. this past sunday I pull out of a buddy's driveway onto Fraser hwy ( traffic closing in fast ). I take the aging 1600 to 5k put my foot on the clutch and pop! ...i got a wet foot. around the block I go, back to my buddy's. ...all she'll need is a clean and polish.... I pull the cotter and the pin then fight with the spring clip and extracted the piston... doh ... the spring in the clutch master had broke in three places and one curl got jammed between cup and bore. so ya its a good thing she has a stock carb, stock cam and a good starter. I got funny looks all the way through Surrey as I failed many shifts up and down on my 37km trip home. This reminds me exactly of a conversation I had not long ago with a client as we stood at a traffic signal we are re-building. In brief...the modern zombie exists because the new cars practically drive themselves. He recalled driving his dad's dump truck home to Langley with no clutch (broken linkage) from Richmond as a young fellow. I drove for many years pumping the brakes, double clutching for non-existent syncros and "setting up" for any steering movement that may be required...total focus and anticipation of different scenarios was mandatory to keep the paint intact on every trip, it wasn't very safe but easily the best drivers education ever! 8 months since the last report and I cant believe its still running! the sporadic coolant loss was not only due to the stock hoses giving up the ghost but a slowly failing head gasket. the Red Missile has reliably commuted from Richmond to Langley (45km each way)5 days a week for the last 6 months or so. knowing that the majority of the components are stock I do a daily check before sending the woman off to brave the weather and traffic. over the last month the coolant consumption has increased and im seeing white frothy oil on the rad cap and just today I saw milk on the inside of the oil filler cap. bearings in the water pump are going and I could feel a bit of a clunk when I pulled on the fan this afternoon. the bmc has been polished a few times now but shes losing a bit down the fire wall and needing a weekly top up. the dying water pump is slowly eating the fan belt as the stock alt try's to keep up to the stock lights and wipers along with the after market stereo, seat warmer, and the fan on the rear shelf that aids in defrost/fog. I said we should think about pulling it off the road and doing the motor, hoses, hydraulics and a re spray but she said I got tow money. Why not stick an LR160 in there? well no time this weekend for a new ir alt. the hg gave up the ghost and blanketed a gas station in a white fog. with the head off the culprit was clear. 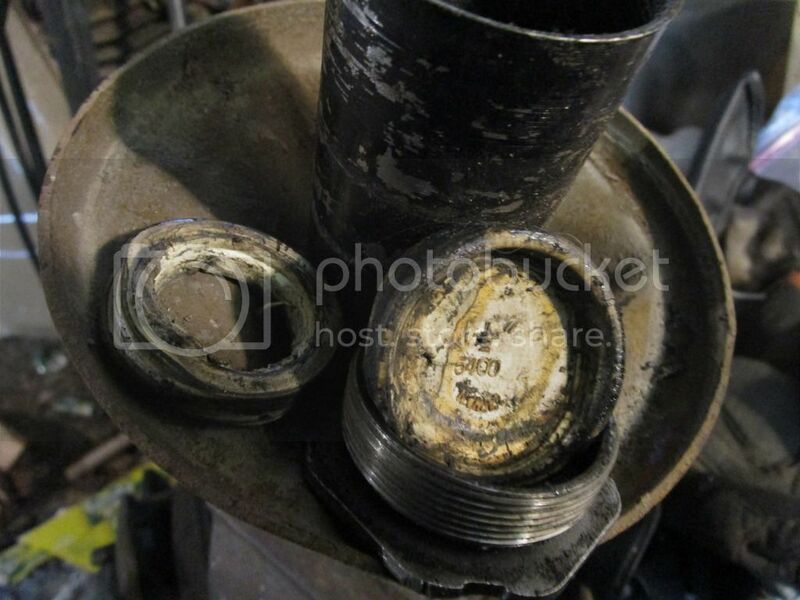 again the hg comp ring on no4 cracked as it hung perilously over the bore. finger crossed that she makes it to and from work today. who has the parts and whats the numbers ? is this a lordco thing or do I get the jam nuts from Andy and bearings from motion canada(BC bearing) ? Bearings are available across the shelf, or at a bearing supplier. Lock nuts are a Nissan part, around $5 each - Dealer item. I machined up a set of removal/installation tools years ago in my youth to make the job easier. They have been let out so many times - it might be easier to count the locals that have not used this set of tools. Contact me Robyn. You'll also need a hell of a torque wrench and a dam solid and heavy work bench - final torque is 25-33 kg/m or 181-239 ft/lbs of torque from the factory service manual. Also to note; there are three different length distance pieces - the spacer between the bearings. So if you have both arms apart - don't mix up the distance pieces.